The event held on 13 March was presided over by the Right Hon the Lord Kerr of Tonaghmore, Supreme Court Justice. The event was a spectacular battle of advocacy between Law Department students; Thomas Spencer and Samantha Balla for the appellants; and, Alexandra Varga and Lewis Hooper for the Respondents, with the appellants adjudged the winners by a hair's breadth. 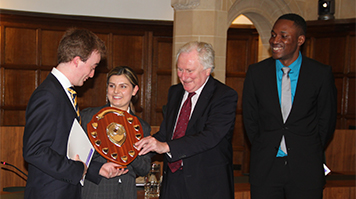 All the finalists will be offered a place in next year's London Universities Mooting Shield external competition which will begin in September 2014. Lord Kerr stated that he "was extremely impressed with the standard of advocacy and mooting of all the students involved". Overall, the event was a great success and was well attended by the LSBU Law Society, students and staff alike. The event was also attended by Douglas Denham St. Pinnock, one of London South Bank University's Independent Governors, whose continuing support of the Student Law Society in securing high profile speakers such as Major General Howell, former Head of the Army Legal Service, and Sir Andrew Mcfarlene, Lord Justice of Appeal, is much appreciated.